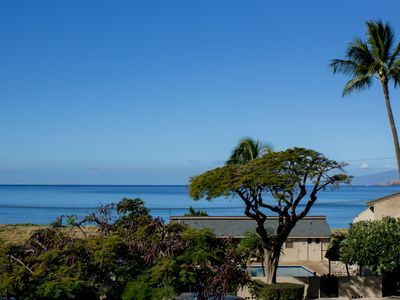 Elua Village unit #1308 is one of the best ocean front condominiums on all of Maui. 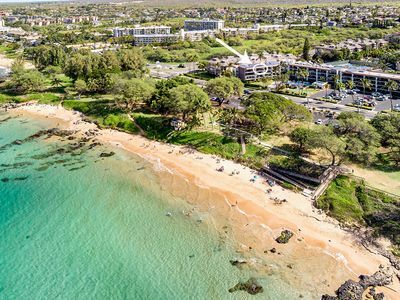 One hundred yards to the beach, lush grass, birds of paradise and the Wailea Beach Path are all that separate you from the sand and sea. Exceptional snorkeling is routine at Ulua Beach and humpback whales are always in view during the winter months. We have just finished an extensive and complete remodeling. The remodel was finished September 2008. Nothing was spared. All new windows, floors, custom African mahogany cabinetry, granite counter tops, and designer lighting are just a few of the new details. Please see the new Virtual Tour link below. The master bedroom offers a new king bed with Ralph Lauren linens and an island weight duvet. 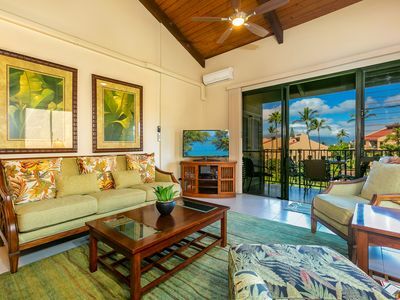 The sliding glass exit from the master takes you directly out to your lanai which wraps to the front of the unit, with an amazing front row seat to Elua beach. The master bath has a deep soaking tub/shower and a separate two sink vanity area with granite countertops. The second bedroom offers two twin beds with all the same beautiful touches as the master. The second bathroom has a roomy stone tile, freestanding shower and a stackable Bosch washer and dryer set. 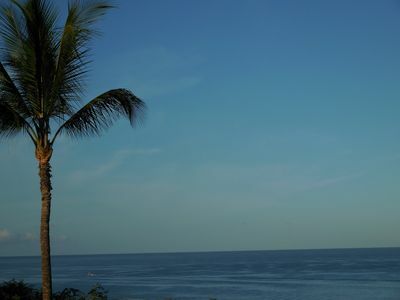 From the second bedroom you can wake up and enjoy the ocean view from your bed. 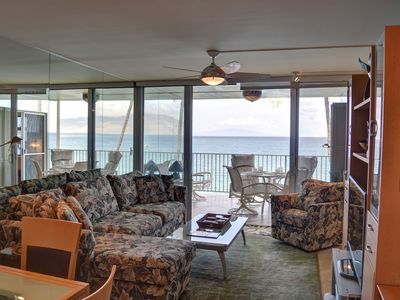 If you like to sleep with the doors open, you will most certainly enjoy listening to the waves crashing and the whales breaching all night, from any room in the condo. The living room holds the most wonderful view of the Pacific Ocean. 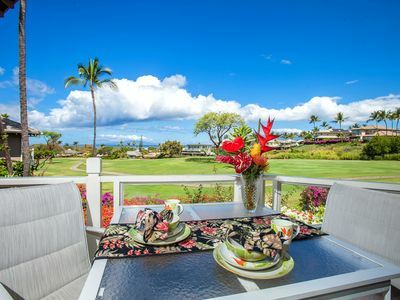 Open the triple paneled sliding glass doors and feel the island air drifting in off the ocean. 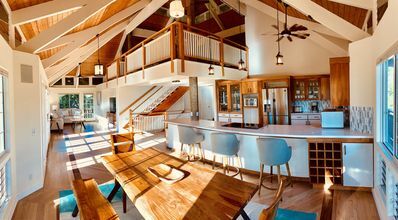 The living room is open space that includes the dining, and kitchen area, with counter seating around a custom designed granite island. 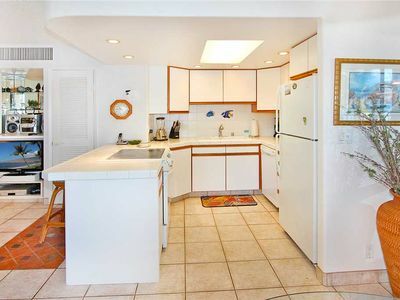 Decor and Bosch appliances throughout the kitchen. All the custom finishes you would expect in this magnificent setting. Unit #1308 has been decorated by designer, Rodney Briggs. He is a senior designer for Ralph Lauren at Cherry Creek Polo, in Denver Colorado. His touches along with the the Ralph Lauren Beach line through out this condo promises to give you that island feel you are seeking. 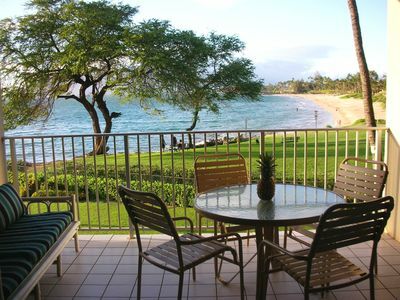 The beach front lanai is the most perfect setting to watch the sun sink into the ocean. Every night you are guaranteed an ocean front dining table. 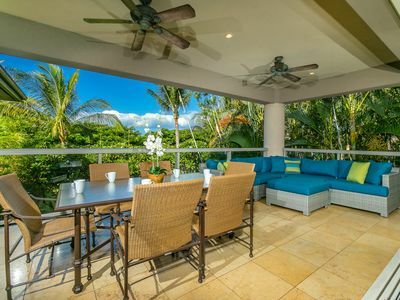 During the day you will enjoy breakfast, lunch or relaxing on the chaise lounge chairs on your ocean front lanai. 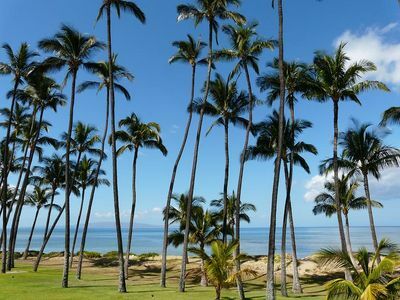 Whether you are looking for your perfect family vacation spot or a romantic getaway, Elua Village is a wonderful place to spend your time on Maui. 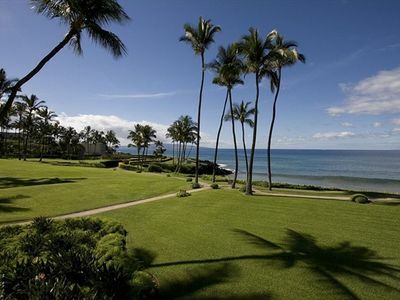 Elua offers two pools, an exercise room, ocean front chaise lounge chairs and a paddle ball court. 24 hour security is an additional and comforting amenity. 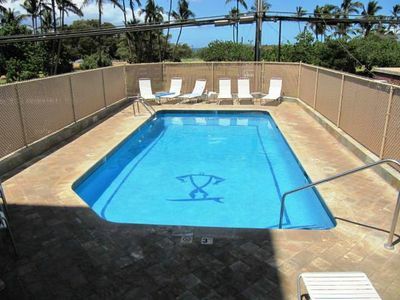 The lower pool is ocean front, perfect for the kids. 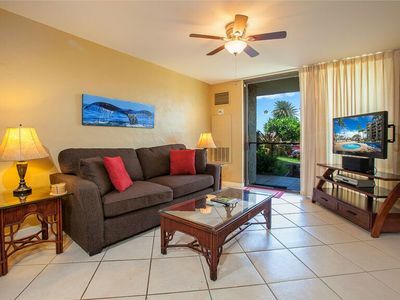 You can enjoy the ocean breeze and take a break from the waves and sand. 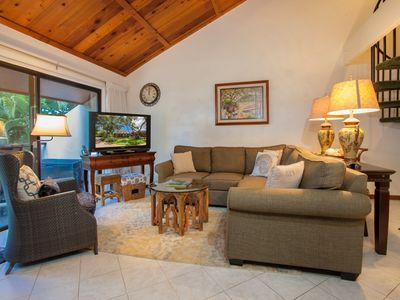 The upper pool is in the heart of Elua and is surrounded with lush tropical greens. Chaise lounge chairs are available on the grassy knoll just outside the unit, where you will enjoy cabana shade and the ocean mist. Please give us a call or email for many more wonderful details. 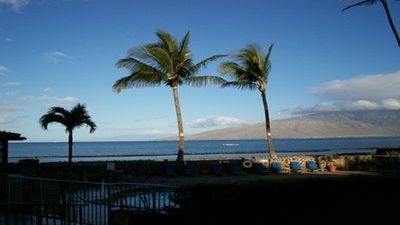 We will be more then happy to help you arrange a beautiful and memorable trip to Maui. 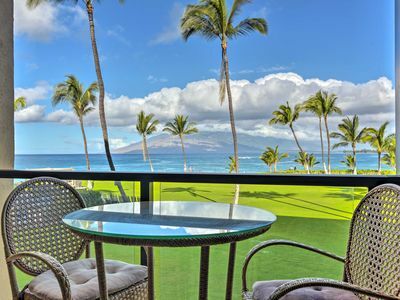 Maui on a Budget? 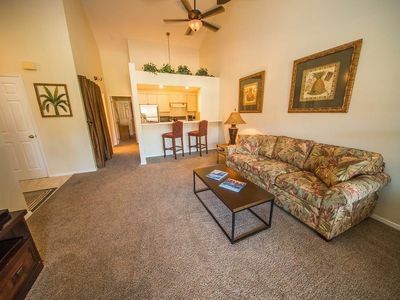 Great condo with CENTRAL Air Conditioning! 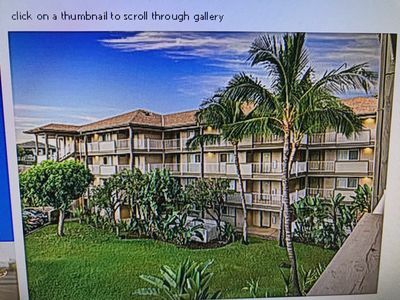 ~Luxurious Remodel~ Ocean-View/Golf-front~ Book now! 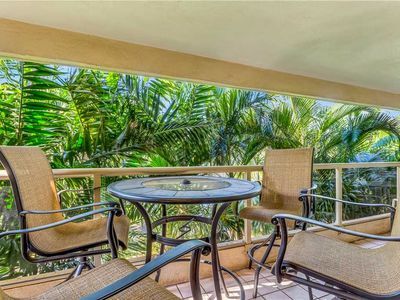 Newly Listed Beautiful Condo across from Kamaole III Beach!